Radio Alice was a free radio station in Bologna from 1973-1977. Rather than attempting to objectify events in the world, they set out to create a flow of sounds, information, messages and poetry, silences and abuse. Like the manifestations of Dada, transmissions were seen as immediate cultural subversions. Bifo, who worked on Radio Alice was interviewed by Carlos Ordonez at the recent conference on Autonomy (’After Marx, April’) in London. The interview was conducted in English. The autonomia movement in Italy during the seventies emerged from the new proletariat of disaffected and unemployed youth, workers and intellectuals creating a radical opposition to institutional politics. Q: How did Radio Alice begin, and what experiences did it attempt to address? 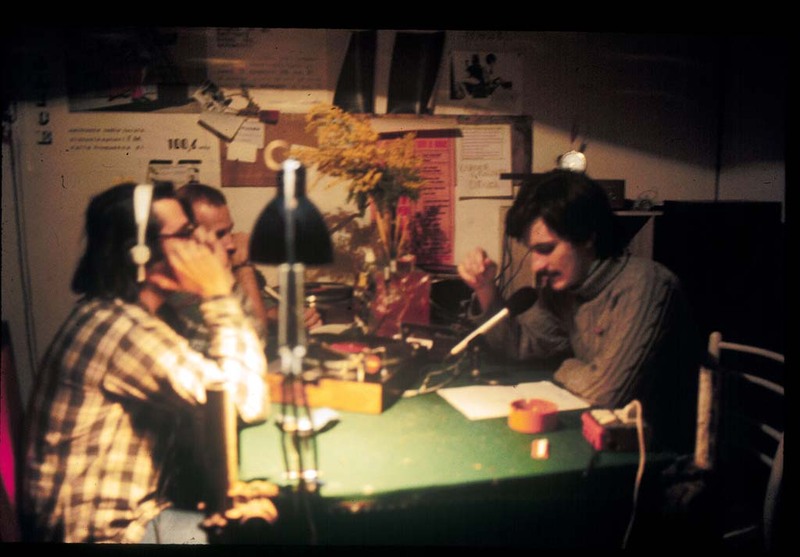 Radio Alice started in February 1976 with people who came from the experience of Potere Operaio, a leftist revolutionary group and people involved in the movement of Autonomia. We did not think of Radio Alice only as a political means but, first of all, as a possibility of organising the experiences of a homogenous community. We were speaking of little groups – feminists, gays, workers. I emphasize this ’little group’ character because we did not conceive of the radio as a political organisation that has to ’state decide’ who can speak or can’t speak. We considered the radio as the point of intersection of different experiences – every experience being different from the other. We did not think about attempting to homogenise these different groups and points of view. Q: How was the radio organised? We had a weekly assembly of the different groups who were working in the radio, and we organised a general programme for the week. Anyone who wanted to propose something for the programme could come along. Of course, the programme referred, in general, to the social and cultural areas that were somewhat homogenous. The starting point for the radio was the different social experiences of the autonomia and, on the whole, the people who listened to the radio were engaged in this social area. Another way of organising the transmission was with the use of the telephone which was connected directly to the radio station. This created a special kind of interchange of information. Q: So you used the telephone as a means of bringing people together? If you wanted to say something to the people listening, you could. The people working on the broadcast also transmitted their own messages. We had a political bulletin each lunch time for an hour and after that, we had direct political information coming in from callers. We also organised ’listening groups’ and this created the possibility of a continuous feedback involving a lot of these small listening groups. For instance, one listening group of students occupied a technical school and immediately called us in order to speak of the occupation. Immediately after, we received a lot of other calls from other schools asking for information and questions about the kinds of problems the group faced. This gave rise to the possibility of not only the circulation of information but also the circulation of struggle. Q: Was there a critical examination of news as a phenomenon? I am opposed to the idea of alternative news which attempts to expose the bourgeois news as lies. You see, I do not have truthful information opposed to the non-truthful of the bourgeois press. I have my information. That is all. And I prefer to diffuse or mix my information. I don’t know if that is the truth; I do not believe that it is the truth; I do not believe that the truth exists at all. I believe that there are a lot of possible forms of information, every information being connected with a form of life. I choose a form of life and I diffuse the kind of information connected with this form of life – that is all. Q: Did you explore the forms involved in radio as well as the content? . We gave special importance to the problem of form. I prefer to say to the problem of the language we chose. For instance, all the Free Radio’s in Italy generally have a framework except for the political bulletin and even that was loose. This kind of destruction of the framework gave rise to the possibility of speaking all kinds of different ’languages’. When we destroyed the framework it opened out all other possibilities, but of course, you still have to choose between the different possibilities. We rejected any kind of censorship, political or aesthetic. (The idea was that we were an artistic object). Speaking about the forms of language we used, what I liked was information that was simulated (false information). One time, the police went to the biggest square in Bologna where young people meet, and arrested a lot of them under the pretext that they were dealing in drugs. It was a period of attack by police due to pressure from the owners of businesses in the centre of Bologna who wanted a clearing-up operation to get rid of these young people. I was at the Radio and I called the head of police – the sheriff – telling him that I was a journalist from a big newspaper in Bologna. I told him that I realised he had arrested 35 people and I wanted to know whether he would continue to go on with these politics because the town had been asking him to get rid of these dirty people from the squares for a long time. He said yes, and that he had been waiting for a long time to do it but he would be arresting more people the next day. I then asked whether the arrests would just be confined to drug dealers or to extremists as well because it was surely not enough just to arrest the drug dealers. He agreed and was so happy to speak to a big journalist. But then another section of the police who was listening in to Radio Alice, went to the office of the sheriff to tell him what was happening, so that ended the call. But that was a form of real information. We were obliging the sheriff to tell the truth by us telling a little lie. In Bologna in 1977, there was a movement in schools, in the universities and in some of the factories and a zone of the city was occupied. The police came into the university and killed someone in the movement and for three days the town was occupied and barricaded. In the period of the riots, Radio Alice was one of the means of communication, organisation and information for the people. The way this coordination worked was that people on the barricades, for example, would go to the telephone and call the radio to say that they needed more people there as they were tired. People from another place would then come and relieve them. Radio Alice was not only the walkie-talkie of the riots; people were also ringing in to say that we were extremists or killers and that we should criticise the movement on the streets. It was 20 hours a day of free speech about what was happening on the streets. On the second day of the riots the police entered the radio station and destroyed everything. The press supported the police action by saying that Radio Alice was instigating the riots through the use of false information. All the people arrested from the radio were charged with using false information and for instigating the riots by means of false information. We had a long theoretical discussion about the conception of true and false news and said that every newspaper is giving news that is true from one point of view. The news is not the reproduction of reality but the production of events, of facts, of reactions etc. so to tell something which is explicitly or evidently false may be the means ofproducing the effects connected with a truth – our truth. Q: To what extent do the people at Radio Alice feel that they were accountable to the movement? The radio was open in such a way that any group disagreeing with something that had appeared on the radio, could come and put across their own point of view. One time a feminist group that did not like a transmission, came and occupied the station for half a day in order to put out their own transmission. But of course, this was an extreme example. We did not aim to be representative of the autonomia movement but we aimed to represent ourselves and I think that all the people coming to the radio had the same aim; to be representative of their own point of view. Q: When I read the texts of Radio Alice, what I found unusual was the use of poetic language lyricism, mixed with music. They were inventive but also obscure, readings from Lautreamont, de Sade, discussions on Surrealism etc. Was that the kind of creativity going on in the movement and how did people respond to it? First of all, there is a very particular set of problems in Bologna. There is a difference between the majority who make up the traditional workers’ movement and on the other side young people Bologna is a university city and a lot of young people come from the south to look for work. And so an opposition and separation has produced a growing distance and break from the worker movement tradition, and this opened out the possibility of a close connection between politics and artistic language, and immediate forms of speech. Secondly, there is a group experience that is the result of both the social situation of Bologna, and from 1973 onwards, a series of lectures, readings and workshops on Anti-Oedipus by Guattari and Deleuze. A concept of Mao-Dadaism emerged and an idea was that Dadaism was an attempt to break the separation between art and life. We thought that Dadaism wanted to overcome this separation, but the experience of the Dada movement meant that it was only a name without the possibility of realising and effecting this kind of overcoming; the idea of ’from the masses to the masses’ is the kind of projectory that may be made through the immediate artistic language. The aim of Dadaism becomes realistic in the condition in young proletarian forms of life. The young proletarian forms of life realise immediately the separation between art and reality. Q: Why did the station stop transmitting? First of all, we did not have money, but that was always a problem from the beginning which we managed to solve. The real reason was that we felt there was a growing distance between our possibilities of information and the political organisation in opposition to the repression. We faced the problem of a change in the feeling of the people. For instance, the audience of punk groups in Italy are more and more interested in drugs, images, videos and music and less and less interested in words, in politics and in the technology of spoken information. I think that radio has been a very important moment of passage, a transition from the political speech and the paper that has moved from the print into the electronic forms of communications. Now, most of the people from Radio Alice are working in music bands, or musical publications and video groups. This is our problem today. What we are doing now is a construction of a form of communication beyond words, beyond speech. We had reached the limit of what is possible just using words. Radio Alice was using more and more poetry in the transmission and less political messages. To read poetry over the radio after 1977 was crazy. You had to speak about the hundred or so arrests every day. Yet to speak about the arrests means nothing if every day you have to announce a similar message. When you have to say each day that one, two, three hundred people had been arrested yesterday, you are completely impotent and powerless. You say the same things for 10 days and nobody will listen to the radio because it is only depressing information and It is not some political indication nor is it some linguistic communication. It is only depressing information. In that moment we had the impression that the contradiction between our aims and the political needs was an impossible contradiction to overcome. In fact we stopped the radio and some of us engaged ourselves in the defense of prisoners and most of us started to work also with video and music. Q: What kind of connection did you have with other forms of communication? Before we started Radio Alice, a group of us were working on a publication called A Traverso which was especially concerned with problems of communication, information, relationships between forms of language. It was a paper of poetry, literature and political literature. From the magazine we went to the radio with the feeling that we were passing to a more developed form of communication. There was no contradiction in this as we continued to produce the magazine. On a radio, you can’t do things that you can with music, video or drugs. I think that drugs are a very important area of communication. We generally use drugs like a commodity. But I think that drugs are not a commodity but a communication technology. I think we can also do a scale in the relationship between social forms of life and communication technologies. The old working class did not use music or video but used newspapers and speeches. The meeting is overcome by the existence of the telephone. When the telephone exists in most houses, the meeting becomes less and less useful. The development of new forms of communication technology renders obsolete other forms of technology. It does not mean you have to forget these obscure forms of technology because there is still a particular kind of specificity which remains. The speed of written communication is much slower than the speed of radio-communication. But there is the problem of communication technology to produce greater and greater speed. The capitalist knows this very well. If speed is the problem then I think that radio is not fast enough. The radio needs a very rational and discursive relationship between the speaker and the listener. Also the feedback is very slow. I think that music, image and drugs make possible a form of feedback which is absolutely immediate and I think we have to work in this universe of SIMULTANEITY. Radio is the middlepoint between the very slow, distant communication of the written text and the simultaneous form of communications of music, video and drugs. Radio is by necessity, connected as a form of communication based on successive items of information like the written text. The most important thing about electronic consciousness is that you don’t have the need for this succession of items of information – the linear sequence. You are faced by a wall, by alterations of mind. From writing to image is a trajectory that goes from teaching, from the transmission of items of information, to the alteration of consciousness; the immediate transmission, not of concepts of information of distinct items but a wall that changes you in one moment, and then in the next moment, another change. TV is the evident way of this way of alteration. Really TV is a drug, not a fantasizing sense, but in a concrete sense, a kind of alteration of your perceptions. But I think you have to deal with the alteration, with the change of perception in relationship to reality and ourselves. Q: Do you think that TV is reformable? No. It was a problem in the radio movement in 1977 when someone proposed that we should organise a TV network. The majority of the movement said that we did not accept this proposition because of the relationship TV has with its audience. This relationship is very fixed and determined and puts the audience in the position of passivity. We cannot reform the TV and we cannot think of another form of transmission. Different forms of transmission do not create a different relationship with the object, with the gadget. So we have to think, not only of different video transmissions but also towards a different network of consumers and users of the image. What has to be changed is not only the contents, not only the transmission, but also the form of network – the relationship between the people that the transmission may produce. An interview by Rosetta Brooks of ZgPress on 10 July, 2010. No worries Ramona. There's also a film that touches on/ is about the radio station called Lavorare con lentezza/ Working Slowly (2004), which you can watch in English or Italian here. I'm in the process of downloading it myself. Lavorare con lentezza is 100% badass.. highly recommended..